A joint contracture occurs when the structures inside and outside a joint limit motion of the joint. Normally, smooth cartilage lines the ends of each bone in a joint and provides an almost frictionless gliding surface. However, injuries and some conditions may cause joint surfaces to degenerate, which can lead to contractures. Around a joint, tendons, ligaments, and the joint capsule are also smooth and move against each other freely. Injury to and around a joint causes inflammation, which leads to the different structures sticking to each other, resulting in stiffness and limited motion. 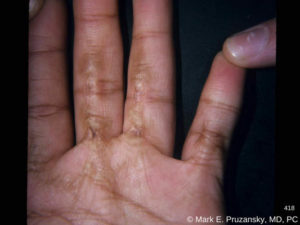 Burn Scar Contracture: The tightening of the skin after a second or third-degree burn. Capsular Contracture: A response of the immune system to foreign materials in the human body. 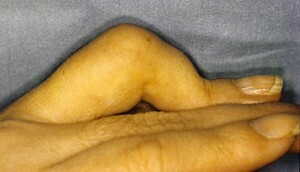 Dupuytren’s Contracture: A condition in which one or more fingers become permanently bent in a flexed position. Muscle contracture: A muscle contracture is a tightening or shortening of muscles. It causes joint stiffness and can happen in any joint. Contractures present as stiffened and shortened muscles and joints. This may also include soft tissue. They cause recognizable and specific symptoms that are easily distinguishable. The hallmark of a joint contracture is an inability to normally move the joint, whether bending it or straightening it. Sometimes the joint is painful. Restricted movement or limited range of motion. Joint contractures can develop due to fractures, dislocations, and arthritis. Even seemingly mild injuries like a sprain can cause a contracture. Specific structural culprits can include tight skin, shortened ligaments, and bony irregularities. Tough, glue-like adhesions may form after an injury as a result of bleeding within the joint and the body’s own inflammatory response mechanism, which then tethers the joint. When the articular cartilage within a joint sustains damage from a fracture or dislocation, arthritis can develop with its associated pain and stiffness. Underlying conditions of the brain and nerves. Prolonged lack of mobility in the affected limb. Muscle and joint contractures may be considered both orthopedic or neurological in nature. X-rays are also helpful to evaluate for possible arthritis or irregular bone anatomy. Depending on the severity of your contracture, your HandSport Surgery Institute specialist may decide to use different treatment options. Early treatment may provide the patient with a full range of motion. Unfortunately, the longer a contracture goes without treatment, the more difficult it will be to treat. Surgery Z-plasty, correction of bum, contracture of palm and fingers. Medications: medications are useful for the management of pain and swelling. Physical therapy: physical therapy sessions are important in the treatment of muscle or joint deformities. Assistive devices: braces, splints, or wheelchairs may be beneficial. Electrical stimulation or heat therapy: newer, non-traditional techniques may be used in an attempt to postpone or avoid surgery. Surgery: contractures can only be completely resolved or treated through orthopedic surgery. Delaying or forgoing treatment may make it difficult or impossible for you to regain your range of motion. Stiff muscles, joints, and skin can interfere with performing everyday tasks at home and work. Regular exercise and an active lifestyle may help reduce someone’s risk for certain types of contractures. When playing sports or lifting heavy objects, use caution to try and avoid injuries. Physical therapy can also be used as a preventative measure by people with an increased risk of contractures, such as those suffering from cerebral palsy. Ask your doctor or physical therapist about the best exercise program for you. If you are injured, see a hand specialist immediately. Physical therapy, occupational therapy, and devices that passively move your joints can also help prevent problem areas from stiffening. Please contact us as soon as possible to schedule an appointment with our talented team. If you have been injured, it’s important to be evaluated by a highly skilled professional. Call Dr. Mark Pruzansky and Dr. Jason Pruzansky at 212-249-8700 to schedule an appointment and obtain an accurate diagnosis.